Looking to do local marketing? It makes perfect sense to with 50 percent of consumers who performed a local search on their smartphone visting a store within 24 hours. Local marketing services from MarketingModo are a cost-effective way to give your business maximum exposure in your local market. From local PPC and SEO to Listings Management and Review Management, MarketingModo is your partner in success in local marketing. There are many businesses and organizations that focus their marketing effort exclusively on their local marketing. Businesses such as auto dealerships, grocery stores, restaurants, local law firms and many more only do business within a certain geographic area – usually the one they are in physically. Adapting tools such as paid Search (PPC) and Search Engine Optimization (SEO) to local marketing requires a different approach than one would use in a national or international campaign and there are additional tools that are used specifically for local marketing such as your local listings and reviews (although reviews are a best practice for any organization they are especially important for local marketing). Local marketing allows larger firms to establish dominance in their own backyards geographically while allowing smaller firms to compete more effectively in their local markets. Why Do You Need Local Marketing Services? Local marketing is more important to small businesses than ever before. Consumers are looking for local search results to find out more about businesses in their neighborhoods and local areas. This means that you have a big chance to grow your business by taking advantage of local marketing opportunities right in your own neck of the woods. 54% of consumers use smartphones to search for local business hours, 53% search for directions to the store, and 50% search for local store addresses. 45% of computer/tablet users search for availability of products at local stores. 18% of local searches on smartphones lead to a purchase within a day, compared to only 7% of non-local searches. 4 out of 5 consumers want to see ads that are customized to their location – city, ZIP code, or immediate surroundings. Clearly, consumers are using local searches to find information about businesses like yours. But are you ready to be found? We treat your business as though it were our own. Its as simple as that. Unlike other agencies that will just take their national marketing tactics and apply them to your local marketing efforts with a bunch of geotargeting, MarketingModo will optimize every aspect of your local marketing presence from conducting local PPC campaigns and optimizing your site for local search, to managing your listing to insure that you are showing up in the Google 3-Pack as well as any relevant local and hyperlocal directories and managing your reviews strategy. We can do it all and to the extent that you need us whether you just need recommendations on what to do to having us manage the whole thing for you. What Local Marketing Services Do You Offer? Do you already run campaigns on Google AdWords or Bing Adcenter? Great! MarketingModo will build and launch highly targeted geo-targeted paid search campaigns for your business. Utilizing geo as well as keyword targeting we will drive local clicks to your site. Newtop aid search? Not a problem. PPC or Paid Search Marketing is a type of advertising you see on search engines such as Google, Yahoo and Bing. You know those four listings at the very top of the results page when you look up something on Google? Those are Pay-Per-Click Ads and some company paid money to show up in those results because they are at the top of the search engine results page and being at the top gives you alot of visibility. We will build our PPC campaigns for your local business targeting only your specific geographic area so if you have a Chiropractic Office in Wilkes-Barre, PA we will bring you traffic from Wilkes-Barre, Wyoming, Pittston, Exeter and not Oregon. Nothing is more powerful than showing up at the top of page one of Google. For many local small businesses, local SEO is the most cost effective channel you can use to grow your business and in local SEO, you have the advantage in that many of the keywords that you want to show up for have little competition. 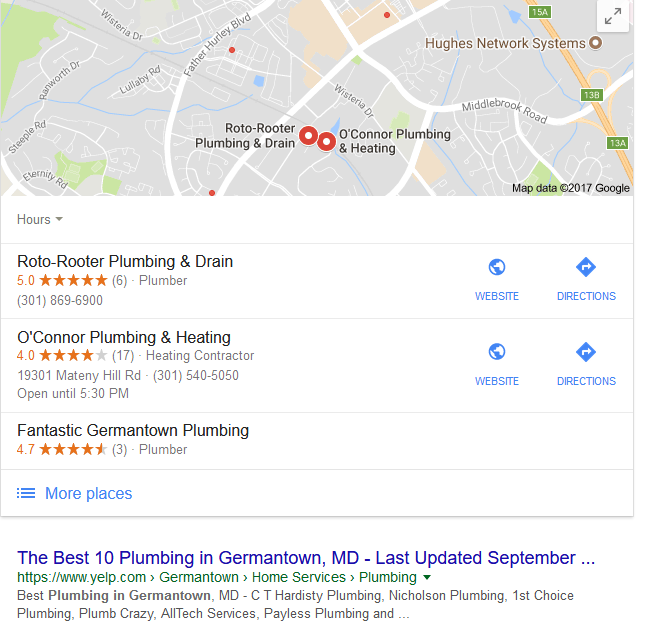 Unfortunately, many local businesses don’t even have a website and even if they do, it is not optimized for local SEO. Let our local SEO experts help get your business’ website dominating local search rankings. You probably have seen the image below when you have done a local search on Google. Did you think your reviews didn’t’ need a strategy? Think again. Reviews are crucially important in digital marketing and especially in local marketing. 88% of consumers trust online reviews as much as personal recommendations. Do you know that over 85% of small businesses don’t even have a strategy for getting reviews? Not only do customers love reviews, Google loves them to and sees reviews as a major credibility boost for your business. Know why most businesses don’t want reviews? They are worried about negative reviews! Worried about negative reviews? Just reply back to them professional and in the spirit of customer service and it will undo any negative perception in the eyes of the consumer. Actively soliciting reviews from your customers will not only drive your business forward in the eyes of prospective customers but it will also drive your business ahead in local marketing. Let the MarketingModo team manage your reviews strategy for you so you can focus on running your business. Whenever we launch local marketing efforts for a client we like to understand as much as we can about the business, its goals/objectives, KPIs as well as the location that they want to target. We will look at what has worked in the past as well as what hasn’t and we will conduct a competitor analysis of that location. (Good News: if you are anywhere other than a major metropolitan area than chances are your competitors are dropping the ball). Once completed with this discover phase we will kick off the local marketing efforts in earnest. What is done depends on the service that you have selected but regardless of which one you chose we believe in 100% transparency and you will be in the loop on everything that we do to make your business a local marketing rockstar. We know local because we were local. No long term contracts required – want to go month to month instead of the usual 6 or 12 month terms? Thats fine with us.